34 Cents of Your Property Tax Dollar Goes To Our Schools. So, this post is about increasing the resources available to Sonoma's public schools. There's background here and here. Due to Sonoma Valley's basic aid status, local property tax revenue controls our school funding, and 34 cents of every new property tax dollar goes to our schools. This post is a long one, and it's in four parts. The first part explains a bit of the history of school finance since 1971. The second explains the impact of redevelopment. The third part describes how property tax revenues can increase. The fourth gives an example of a specific project, The Lodge At Sonoma -- for were the Lodge to be built today, the school district would get nearly $100,000 each year in additional revenue. Because of the dramatic impact of property taxes on local schools, this issue should come up in every planning decision made by the City of Sonoma. California State Supreme Court Chambers. In 1971, by far, the major source of school revenue was the local real property tax. The amount of revenue a district could raise depended largely on its tax base -- on the assessed valuation of real property within its borders. Then the California State Supreme Court ruled in Serrano v. Priest (1971), 5 Cal.3d 584 (Serrano I), finding that the funding scheme invidiously discriminated against the poor because it made the quality of a child's education a function of the wealth of his parents and neighbors. The California Legislature responded by establishing a formula that calculates a ceiling on how much local property tax revenue each district should receive. If a K-12 district's local property tax revenue is not sufficient to meet this "revenue limit," the state provides additional funds up to that level. Today, we call most of the ~1,000 school districts in California "revenue limit" districts, because this formula applies to them, and their funding is determined by a (heavily modified) variant of the system created in response to Serrano I. 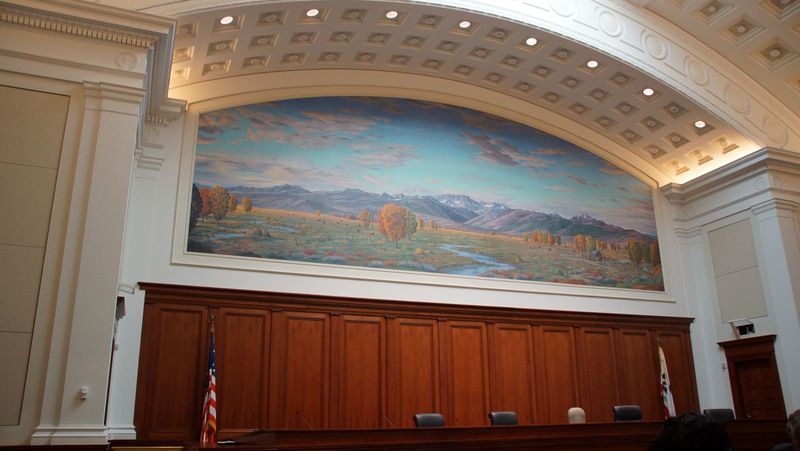 The courts ultimately approved the State's plan, which continued to allow a relatively small number of districts to retain a higher level of funding, based on well-above-average local property taxes. The rub was that if there was other State aid those districts were to receive, that aid would be reduced, dollar for dollar, by the amount that local property taxes exceeded the revenue limit. These districts became known as "basic aid" districts, a term that comes from the State Constitutional requirement that all students receive a minimum level of state aid, defined as $120 per pupil, regardless of how much local property tax revenue their district receives. Thus, we ended up with a naming system whereby the "revenue limit" districts are poorer than the "basic aid" districts. Which is a wonderfully delightful piece of counterintuitive nomenclature. The initial number of basic aid districts was small -- places like Pasadena and Beverly Hills. In the intervening decades, the number of basic aid districts has continued to increase, to the point now where nearly 15% of all districts are basic aid, and some of those districts are quite large indeed. After forty years of trying to equalize school funding, places like Sonoma find themselves right back where they were before Serrano I -- that they are entirely dependent on local property tax revenue -- and for such districts, the exception has swallowed the rule. For nearly a generation, local property taxes were essentially irrelevant to school funding in Sonoma Valley. This was not merely due to the consequences of Serrano I. Redevelopment also played its part. As California's Legislative Analyst points out, prior to the dissolution of redevelopment agencies in 2011, most of the growth in property taxes from redevelopment project areas went to the redevelopment agency, rather than other local governments like school districts. In Sonoma, this meant that any significant commercial development, most of which took place inside city limits, almost always saw the increased property tax revenue redirected exclusively to the City of Sonoma, rather than SVUSD. I don't think that any local leaders were intending that the consequence of this policy would be that the School District would thereby qualify for additional State assistance as a revenue limit district, but that was the actual consequence. Along came ABX1 26 in 2011, which dissolved all redevelopment agencies. Under the dissolution process, the property tax revenue that formerly went to redevelopment agencies is first used to pay off redevelopment debts and obligations, and the remainder is distributed to local governments, and the school districts receive their share. When redevelopment went "boom," this was thus a stark change. It's difficult to point out just how significant the change was. Indeed, many individuals who are quite knowledgeable regarding California's school system had no idea at all how much property tax was being diverted from the schools through the use of redevelopment, and City officials themselves hotly disputed that money was being redirected away from schools at all -- a point that is now nearly universally recognized to have been incorrect. I've touched on the importance of increased funding for schools in previous posts here and here. Because local property tax revenue controls school funding for Sonoma Valley due to the district's basic aid status, more revenue depends on increasing local property tax revenue. How can that happen? California's Legislative Analyst, as usual, has a nice explanation. There are three mechanisms -- recently sold properties, newly improved (or newly built) properties, and then Proposition 8 "decline in value" properties. When a property sells, its assessed value resets to the purchase price. This represents additional value that is added to the tax base because the sale price of the property is often much higher than its previous assessed value. Newly built property and property improvements add new value to the county's tax base when new construction takes place or improvements are made — mainly additions, remodels, and facility expansions — because structures are assessed at market value the year that they are built. Finally, Proposition 8 "decline in value" properties contribute significantly to growth or decline in a county's tax base because their assessed values may increase or decrease dramatically in any year. A particularly large impact on assessed valuation tends to occur in years when a large number of these properties transfer from Proposition 13 assessment to reduced assessment (due to falling real estate prices) and vice versa in a rising market. What do these changes in revenue look like, and how can someone determine how much property tax revenue will change? The San Francisco Chronicle has a nice overview of calculating the numbers for a home purchase, and the rules generally hold up for commercial properties, too. If you pick a typical Sonoma Valley tax revenue area (TRA), like, say, 006-032 (which covers part of the City of Sonoma), the rate's easily determinable by checking Sonoma County's table here. There's one piece of data that I've not been able to find, though, and that's the portion allocated to each entity of the property tax collected. If a reader happens to know where Sonoma County's put that data, please forgive this bleg and let me know. However, the number (ratio) is not too difficult to determine for a particular entity for a particular year. For Sonoma Valley Unified, the numerator is the property tax received for a particular year (in 2012-13, that appears to have been $25,176,110). The denominator is the total assessed value of all real property in the school district ($7,176,806,784) multiplied by the rate (1.108800%). 31.44% of each property tax dollar thus ends up going to SVUSD. 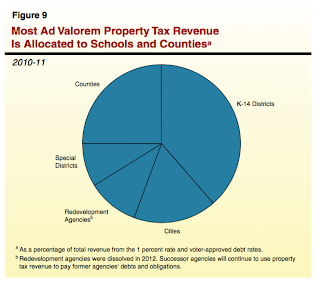 "Allocation of Ad Valorem Property Tax Revenue"
That's not the end of the story. As the Legislative Analyst's graph on the right shows, about 40% of property tax revenue is allocated to K-14 (not K-12) education; about 8% of every property tax dollar heads to the Santa Rosa Junior College. Further, there's another 8% marked as "redevelopment," which is ending. The school district will end up with about 3/9ths of that money. When redevelopment is wrapped up, the school district will therefore receive ~34% of each property tax dollar. So how much money is at issue with a particular project? Well, consider, for a moment, The Lodge At Sonoma. It's a good example, because the development is unitary -- it's on one piece of land for tax purposes -- and because its development was relatively recent (opening in 2000, IIRC). The land that the Lodge sits on is valued at $7.2 million for property tax purposes, and the improvements (the structures) are valued at ~$19.2 million. The total assessment is thus $26,387,300. Knowing that the effective tax rate for the parcel is 1.108800%, we just multiply those two numbers and get $292,582.38 per year. The official "bill" is $381,108.52, but that includes non-property tax water charges, among other things. So how much does the school district get? You'd think $91,987.90 if you just applied the rules I posted above. You'd be completely incorrect, but at least you'd have followed instructions properly. The reason you'd be wrong is due to redevelopment. 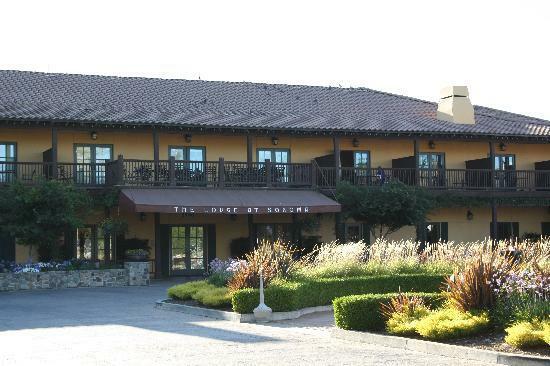 As Bob Klose reported in the Press Democrat on June 14, 1998, the Lodge was built in part with money from the City of Sonoma's Redevelopment Agency. 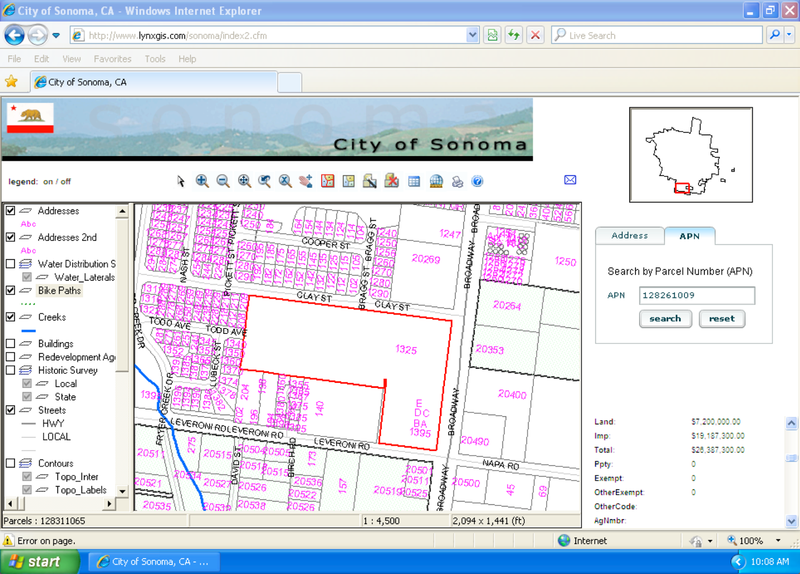 Thus, the entire increase in property tax went to the City of Sonoma. The school district's share was limited to the assessed value of the parcel prior to the project. I've looked at the records, and it looks like the assessed value of the parcel before the construction of the Lodge was $425,000. The assessed value may have been higher than that due to some increase over time under Prop. 13, so call it $600,000 as an estimate. The school district's share of the property tax collected is ~$2,091.64. It is probably therefore unsurprising that people have rarely brought up the school district budget at planning commission meetings in the City of Sonoma. But they probably should. Because were the Lodge to be built today, the school district would get approximately $100,000 each year. That's equivalent to an Impact 100 donation every twelve months. A final point: because Preserving Sonoma is under discussion in town, I can certainly see how someone like Darius Anderson would try to use a post like this to his advantage. This post, though, is about more than the debate about any single project. It's about a factor that's just not being weighed at all in the planning process in Sonoma. Because commercial development (and, increasingly, tourist-oriented development) is concentrated in the City of Sonoma, the impact on our schools of planning decisions in the long run is profound indeed. To paraphrase Serrano I, education is a unique influence on a child's development as a citizen and her or his participation in political and community life. The pivotal position of education to success in American society and its essential role in opening up to the individual the central experiences of our culture lend it an importance that is undeniable -- education is the lifeline of both the individual and society. Failing to consider education in the planning process is a disservice not least to our students, but to our entire Valley.